Bouquets of beautiful flowers for birthday, anniversary, wedding, graduation. A bouquet of beautiful flowers is one of the best ways to congratulate impressive event, such as birthday, anniversary, wedding, graduation, and in the holidays or any other occasion. 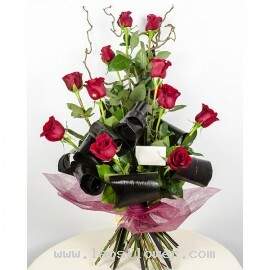 All our bouquets are wrapped in paper or material furnished and decorated with a bow. 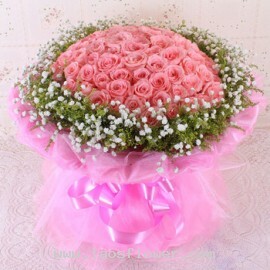 10 pink roses bouquet arranged to show one-sided accent with eucalyptus. Wrapped in white paper and tied with a black bow. Color of the roses and materials used can be changed. Just tell us how do you like. Occasionally, substitutions may be necessary to create your bouquet due to the availabilit..
A bouquet of 10 red roses wrapped with red paper and tied with brown ribbon. * The color of roses and materials can be changed as you wish. Please let us know when ordering. Occasionally, substitutions may be necessary to create your bouquet due to the availability of certain flowers in various p..
A bouquet of 100 pink roses accent with white gypsophila flowers around the bouquet. Wrapped in pink lamy and pink bow. The color of roses and materials can be changed. Please inform the staff when ordering or e-mail us. Occasionally, substitutions may be necessary to create your bouquet due to t..
A bouquet of 100 red roses accent with white gypsophila flowers. Wrapped in pink and white paper and tied with ribbon. The color of roses and paper can be changed as you wish. 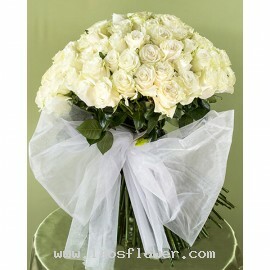 Occasionally, substitutions may be necessary to create your bouquet due to the availability of certain flowers in various..
101 white long-stemmed roses bouquet wrapped in pure white paper. This bouquet is good to send to your angle. 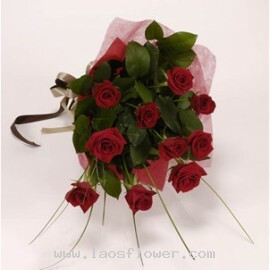 The color of roses and paper can be changed according to customer requirements. 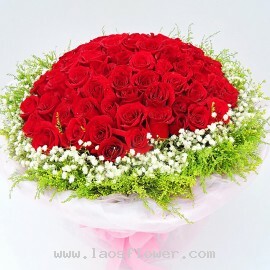 Occasionally, substitutions may be necessary to create your bouquet due to the availability of certain flow..
108 red roses bouquet arrange in a huge round shape accent with white gypsophila. Wrapped with white paper and tied with pink ribbon. This bouquet is good for propose. The color of roses and paper can be changed. 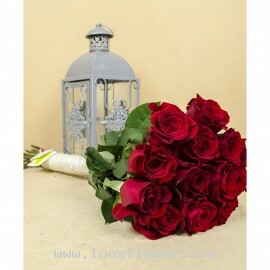 Occasionally, substitutions may be necessary to create your bouquet due to the avail..
108 roses bouquet. Pink roses in the middle surrounded by red roses accent white gypsophila around the roses. Bouquet wrapped with paper. Occasionally, substitutions may be necessary to create your bouquet due to the availability of certain flowers in various parts of the country. 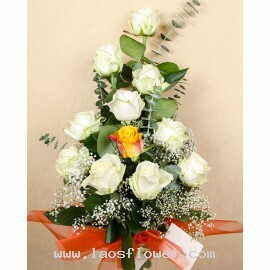 Substitutions m..
108 white roses bouquet arrange in round shape. Wrapped with white paper and brown paper. Adorned with a bow tie made of white lamy, No. 108 commonly used by Chinese for propose. 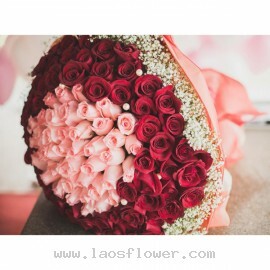 The roses and materials used for this bouquet can be changed on request. Occasionally, substitutions may be necessary ..
12 pink roses bouquet accent with leaves and wrapped in pink paper and clear plastic on the outside and tied with white bow. The color of roses and paper can be changed. Please request when ordering. 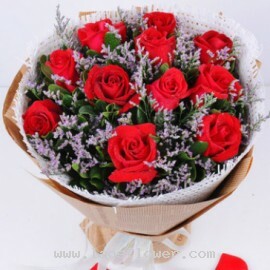 Occasionally, substitutions may be necessary to create your bouquet due to the availability of ce..
A bouquet of 13 red roses arrange in long bouquet and decorated with exotic foliage. Wrapped with red paper and tied with red ribbon. 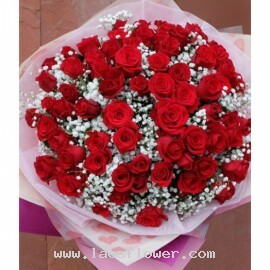 This bouquet is good for birthday, wedding anniversary or graduation day. The color of roses and materials can be changed. Please tell us when ordering. 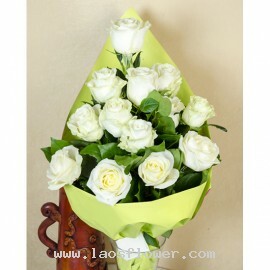 Occasional..
13 white roses bouquet arrange in a pyramidal shape. Wrapped in light green paper and tied with white and green bow. The color of roses and material can be changed as you needed. Please tell our staff when ordering flowers. Occasionally, substitutions may be necessary to create your bouquet due t..
A bouquet of 15 red roses arrange in a long and round shape. * Free shipping with greeting cards. 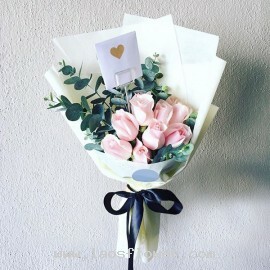 The color of roses and wrapping material can be changed as you like. Occasionally, substitutions may be necessary to create your bouquet due to the availability of certain flowers in various parts of..